People donate their bodies to medical schools for anatomy studies and other purposes, and in exchange, the family gets a free cremation along with the satisfaction of contributing to research. Mortuary schools also use cadavers for students to practice embalming and restorative arts. While working on an endotracheal tube in graduate school, SynDaver founder Christopher Sazekles found that the final product—a plastic model—was highly disappointing. He took one look at it and tossed it straight into the trash. 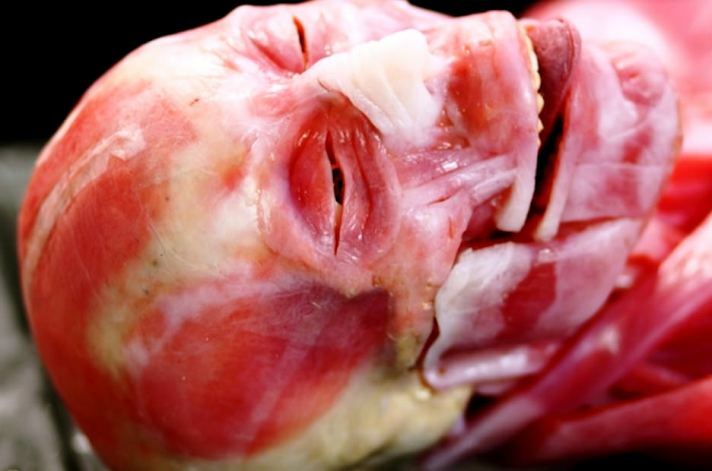 So rather than engineering functional parts of the human body, SynDaver decided to go whole hog and make a human. SynTissue, a synthetic tissue made up of water, salt and, fiber, took SynDaver about 20 years to get right. It’s 75% water, which gives it a realistic feel and the realistic properties of bodies as well. Having touched the intestines, which had fake food in them, I can tell you it feels creepily real. Different configurations of the material are able to mimic over 100 kinds of tissue—including subcutaneous fat and rectus femoris muscle. Using the artificial tissue, the company can build a custom femoral artery, trachea, or entire body. And the most recent design incorporates software that mimics body functions, including a beating heart. At the NFDA convention and expo, SynDaver Labs displayed a synthetic human body designed for anatomy study. This eye-catching example was stretched out on a table for attendees to examine and touch. 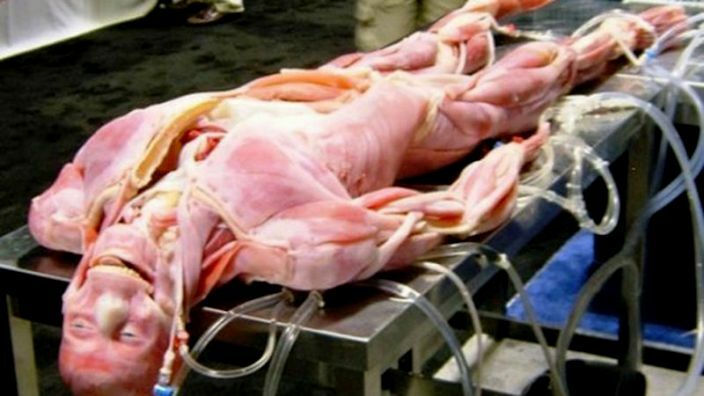 It has every muscle in the body, and some are enclosed in an artificial skin. 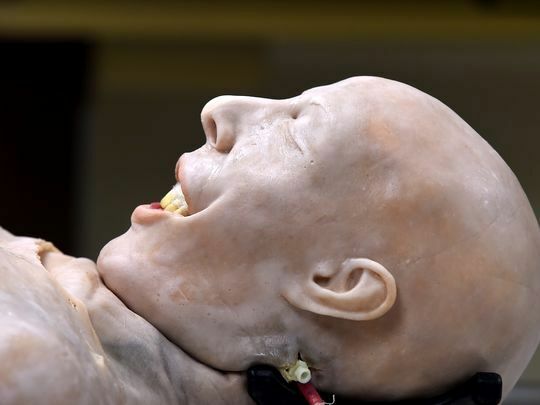 Conar Mahon, SynDaver Labs’ sales director, explains that they make models for surgical simulation, medical education and now, funeral science. The funerary education model features a full vascular system that can be embalmed, and the lips and eyes can be sutured, just like real bodies. The only “difference” is these bodies need to be hosed down occasionally so they don’t dry out. 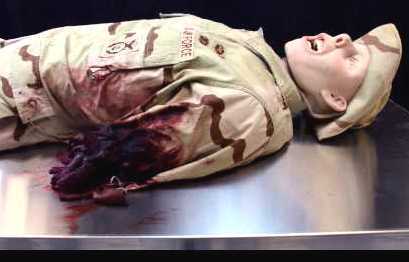 Some schools have explored using synthetic cadavers in their curricula, since the real ones are in limited supply. 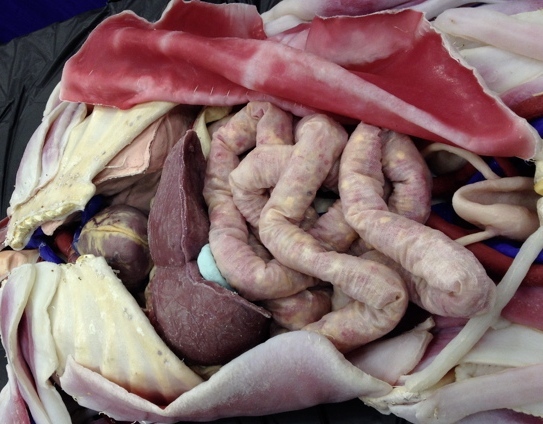 “Many smaller colleges and universities cannot afford a full cadaver lab, and this model, which closely approximates a real cadaver, is very cost effective and on the cutting-edge of the way we can teach anatomy to our students,” Kevin McDade, an instructor of biology at Penn State University, said in a written statement when the cadaver was purchased by the university in January.